A recently retired police dog mauled and dragged a 20-year-old man after he gave it a bowl of water because he felt sorry for it, Riverside County animal control officials said Monday. The attack occurred about 11 p.m. Sunday when the man spotted the stray German shepherd wandering in an Eastvale neighborhood, according to John Welsh, spokesman for the county Animal Services Department. The man felt sorry for the animal, so he brought it a bowl of water. The dog drank from the bowl, then placed its paws on the victim’s chest. That’s when the dog attacked the man and took a bite out of his left bicep. The man also suffered bites to his left leg and ankle. The dog then dragged the man into the street, Welsh said. As the victim screamed for help, friends and relatives tried punching and kicking the police dog. But the animal refused to release the man from his grip. The family became desperate, he said, so some of them grabbed steak knives from inside the home and started stabbing the dog until it let go. The victim’s uncle told an animal control officer that they had “no choice but to start stabbing the dog in order to get the dog to stop attacking, ” Welsh said. After attacking the man, the injured, weakened dog was taken away by animal control officers. The dog was euthanized because of the severity of its injuries. A microchip embedded in the canine confirmed it was once a police dog. Once named Thor, the German shepherd served with the Long Beach Police Department, according to police spokeswoman Nancy Pratt. The dog joined the department in 2009 when he was 2. Thor retired in April because of his age and medical issues, she said. A Long Beach police officer, not his former handler, adopted the dog after it retired. Although the dog was adopted by an officer, it no longer was affiliated with the department, she said. 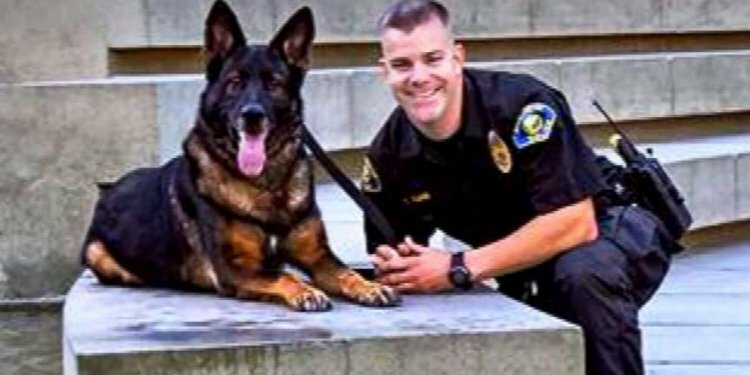 Thor is the second Long Beach police dog to die in a week. A 4-year-old Belgian Malinois named Credo was fatally shot by friendly fire on June 28 as Long Beach officers and members of the U.S. Marshals Fugitive Task Force sought to capture a man they said was involved in a 2014 shooting.